Reflow profile for V-One solder paste? Out of curiosity, is there an official temperature curve for the paste supplied by the V1? I have a homebrew reflow oven and it would be handy to know what time/temperature settings to program into it. For example (and I may be worried for no good reason), when I mill a board it ends up with a lot of spare copper pours that reduce the amount of milling time. That would potentially wind up affecting the actual heat curve the board sees if the V1 firmware assumes a relatively sparse board. In any event it would be nice to know I have the reflow oven as an option. But, obviously, getting the curve right is important. The 'Set Temperature' is what we tell the V-One to heat to, to account for the temperature lag between the thermistor and the PCB. 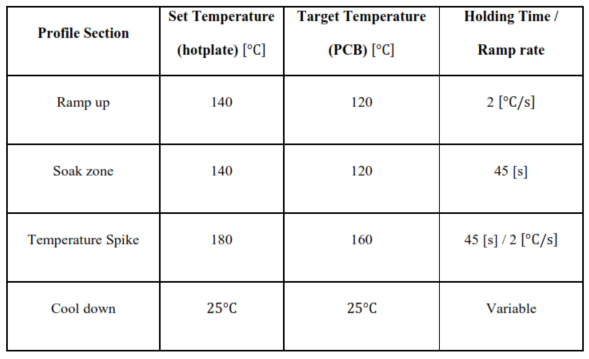 The 'Target Temperature' is the temperature we want at the surface of the PCB. The Holding Time / Ramp Rate is set specifically for the V-One, to get steady and even temperature increase across the PCB. For your reflow oven, I'd start with the 'Target Temperature' settings, with the standard Holding Time and Ramp Rate. From there, see how well and how quickly your oven reproduces the target temperatures, and adjust from there. The reflow profile goes from Ramp Up -> Soak -> Temperature Spike -> Cool Down.